Online ticket sales for ON THE CUSP are now closed. Capricorns & Aquarians get in for FREE with valid ID. Doors open at 9PM. Dress it up, and come out to play! See you tonight! Saturday, January 19th @ Yamashiro Restaurant, Hollywood 1999 N. Sycamore Ave., LA 90068 on January 19, 2019. 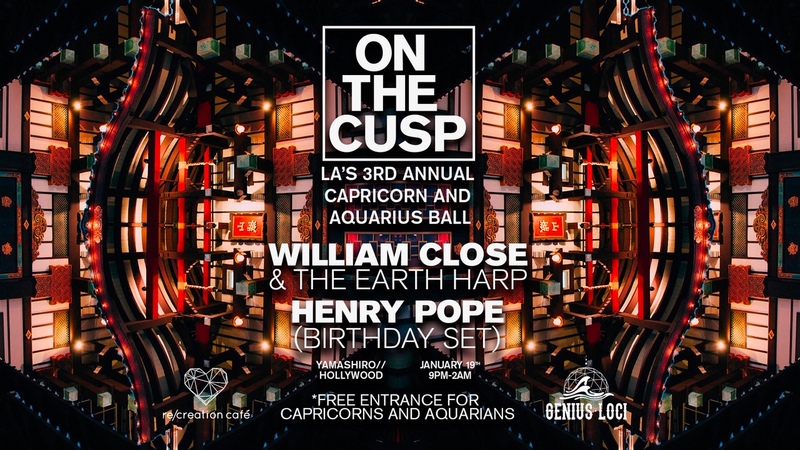 ON THE CUSP - LA's Third Annual Capricorn & Aquarian Ball. Join us Saturday, January 19, 2019 at the stunning Yamashiro Gardens in Hollywood for this special evening. What happens when you combine the energies of the capable Capricorn and the quirky Aquarius? You get a night known as the Cusp of Mystery and Imagination. Come celebrate the beginning of a new year, and a time of transition as we fill the night with rhythmic beats, and symphonic strings at this magical masquerade. This is a formal affair. Dress to inspire the imagination, and by all means, add a little mystery. Masks welcomed. Dance to the deep-house beats of Jeremy Sole, & Henry Pope, with a special up close and personal live performance by William Close and the Earth Harp. The evening will close out with a sound bath performance at 1:30AM. The Ball will be held inside the magical Yamashiro Garden's. If you've never seen Earth Harp live, this will be one you don't want to miss.